UntitledTown Book and Author Festival is seeking volunteers for our Festival on April 25-28, 2019. Info for volunteers is both at the Volunteer Center site, and on our website here: https://2019.untitledtown.org/volunteer/. Room Host—Introduce speaker, monitor room, keep program on-time. Information Booth—Help attendees navigate through festival and Green Bay. Venue Lead—Overall management of venue: range in size from one room (St. Brendan’s) to many rooms (KI Center or Central Library). Support Room Hosts and Information Booth. Trouble-shoot minor problems. Our volunteer coordinator can be reached at volunteer@untitledtown.org. The WSMA State Solo and Ensemble Festival is looking for volunteers! There are three time options for what volunteers will be doing. On May 3rd, there are 15-20 helpers needed for moving music stands to their proper sites, hanging signs, and ensuring that the correct amount of chairs and stands are in each site. On May 4th during the Festival, there are several positions up for grabs. Room monitors will be collecting results from judges to give to the runners, crossing off the event list in their room as the day goes on, showing the judges to their rooms, and always make sure you have a pencil! Runners/Logistics will be going around campus to collect results from judges to the Headquarters of the event. Results/Tabulation will be working in HQ calculating the results from the judges. Coffee and Donuts will be delivering coffee, donuts, and treats to the judges. On May 4th after the festival has finished, there are 15-20 volunteers needed for clean-up which includes putting the music stands back, collecting the signs, putting classrooms back to their original structure, and putting the pianos into the hallways for custodial pick-up the next week. Please contact Professor Adam Gaines (gainesa@uwgb.edu) for more information and to sign up! Are you feeling hopeful? Want to spread some hope and raise some money? The Freedom House is hosting their annual Gallery of Hope fundraiser and is in need of volunteers. Volunteers are needed for September 23 and 24. On September 23rd, volunteers are needed for event setup in the evening. On September 24th, volunteers are needed for event help from 5:00 PM-9:00 PM with duties such as greeting people, collecting money, helping people register and ushering. There is a possibility of event setup taking place in the morning on the 24th if all event setup isn’t complete on the 23rd. For more information and any questions, please contact Lydia Davison at (920-)-435-4646 x1113 or email at lydiadavison@freedomhouseministries.org. Feel like Gathering? You’re in luck! The Gathering Place is hosting their sixth annual Community Day on August 23. Volunteers are needed to help with food service, food prep, and clean up on the day of. Shifts consist of 3:00-5:00 PM for food prep and 5:00-7:00 PM for food service and clean up. Have any questions or want to know more? Contact Susan C. Mader by phone at (920)-615-0783 or by email at lthegatheringp2@new.rr.com. After a successful celebration last year, UW-Green Bay is bringing Phoenix Friday on the Fox back! The gathering will be taking place on July 27 from 5 pm – 9 pm at CityDeck in downtown Green Bay with a performance by Big Mouth & the Power Tool Horns, the night is sure to be a fun time for all those involved. Want to show your Phoenix pride by volunteering? Well here’s what you can do! We are looking for 4 people to help with set up from 4 pm – 5 pm. We are also looking for 2 people per hour to help man the table from 5 pm – 8 pm. If you are interested in volunteering, please contact Kari Moody in the Alumni Relations office at x2226 or moodyk@uwgb.edu. Special thanks to Associated Bank and BayCare Clinic Foundation for sponsoring the event. Want to help first-year students feel welcome as they’re moving in? The Office of Residence Life would like you to join them in helping the new students move in on Sept. 2. The freshman will be moving in between 8:30 A.M. – 12:00 P.M. Volunteers will have to be at the Office of Residence Life/Community Center by 8:00 A.M. If you would like to help, please sign up through the qualtrics survey and you can contact Gail Sims-Aubert for any questions you might have! Go Phoenix! The WSMA State Solo and Ensemble Festival is looking for volunteers! There are three time options for what volunteers will be doing. On May 4th, there are 15-20 helpers needed for moving music stands to their proper sites, hanging signs, and ensuring that the correct amount of chairs and stands are in each site. On May 5th during the Festival, there are several positions up for grabs. Room monitors will be collecting results from judges to give to the runners, crossing off the event list in their room as the day goes on, showing the judges to their rooms, and always make sure you have a pencil! Runners/Logistics will be going around campus to collect results from judges to the Headquarters of the event. Results/Tabulation will be working in HQ calculating the results from the judges. Coffee and Donuts will be delivering coffee, donuts, and treats to the judges. On May 5th after the festival has finished, there are 15-20 volunteers needed for clean-up which includes putting the music stands back, collecting the signs, putting classrooms back to their original structure, and putting the pianos into the hallways for custodial pickup the next week. Please contact Eric Hansen (hansene@uwgb.edu) for more information and to sign up! Untitledtown Book and Author Festival is looking for volunteers to help during April 19-22. There are various shifts available and jobs include: speaker introductions, author support, and assisting/registering visitors. Our own professor, Dr. Rebecca Meacham, is on the board of directors for this special event for the second year in a row. The festival will be happening in downtown Green Bay and will feature many authors from across the state, the Green Bay area, and the big authors of R.L. Stine and Roxanne Gray. If you would like more information, please contact David Siegel at david@untitledtown.org or (920)-609-7058. Can’t volunteer with the campus as a whole? UW-Green Bay is sponsoring the Volunteer Center of Brown County in their participation in the national Make A Difference Day on October 28. Volunteers will be responsible for their transportation on October 28, but will still be recognized as a part of the UW-Green Bay volunteers. You can go to www.volunteergb.org/madd for more information on how to get involved! Girls on the Run is a non-profit youth development program that integrates running into lessons aimed to help young girls (3rd-5th grade) lead joyful, healthy, and confident lives. On October 7th, we would appreciate 10-12 volunteers to helps us host a water station at the Bellin Women’s Half Marathon. This helps us spread awareness about our program and partner with an event that empowers women. This time is 7:30 a.m. – 10:30 a.m. and includes stetting up the station, distribution, and clean up. Please contact Kathy Olson if you are interested and available at Kathy.olson@girlsontherun.org. In this program, trained coaches lead small teams through our research-based curricula. The 10 week program culminates with a celebration 5k event at Fox Valley Technical College on November 4th. We have a variety of roles for volunteers between 5:30 a.m. – 12:30 p.m. that includes set up, registration, facilitating an activity, course marshal, finish line volunteer, finish line refreshments, and clean up. Please contact Kathy Olson if you are interested and available at Kathy.olson@girlsontherun.org. 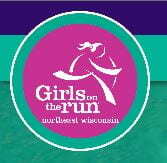 For more information about Girls on the Run, please visit www.girlsontherunnew.org.